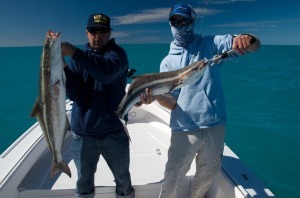 Key West’s reef fishing consists of fishing water primarily deeper than 30 feet. 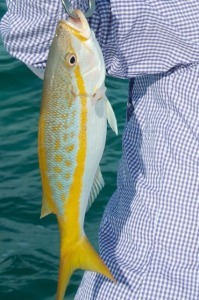 Reef fishing is a good style of fishing for people who want to get fish to bring home for dinner. This style of fishing is done mostly by anchoring up to some structure and dropping bait into these structures. Patch reefs consisting of coral, sea fans, hard bottom, and small wrecks are all areas that we would fish on this type of trip. There is plenty of variety that you will get into during this trip. Mangrove snappers, yellow tail snappers, mutton snappers, cobia, jacks, sharks, barracuda, red grouper, black grouper, and mackerel are all species we typically see out on the reefs. Reef style fishing can also be great for the kids. With lots of action, and ease of angling, your children will be very entertained during the reef trip. Though, being a bay boat, the weather can be a bit edgy for most anglers. High winds and weather systems can make it uncomfortable to be out in unprotected waters. This happens only every once in a while on our charters. Since our boat is so versatile, we will never be left without any options. Another plus to fishing the reef is having the capability of snorkeling throughout your day. There are many reefs that come up to 5-10 ft that are perfect for anyone wanting to see an amazing amount of sealife. Just let your captain know before your trip that you would like to get in the water and snorkel at some point so he can productively route your day. If you need snorkel gear, it can be provided per request. *We do not fill coolers on any type of charter; catching for a few meals is okay. *The Nearshore Reef Trip is weather dependent. If the weather for the day booked is not considered ideal for Wreck/Reef Fishing, you will be given the option to back down to a more manageable charter for the weather given for that day. 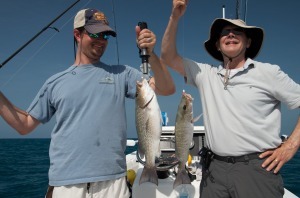 Book your Key West fishing charter today!